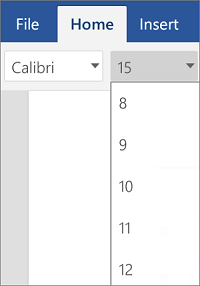 You can change the font or font size for selected text in a Word document, Excel spreadsheet, or PowerPoint presentation. 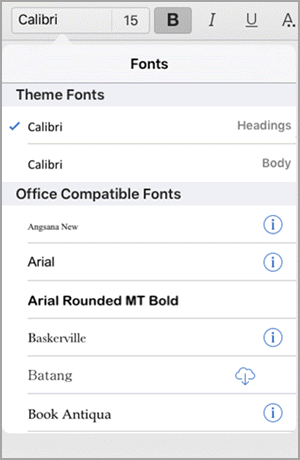 Tip: Hold your device in landscape mode so that you can see more of the formatting options on the ribbon. 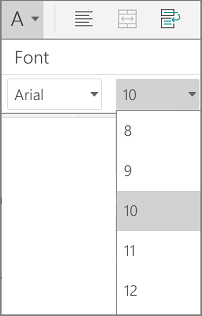 Use the handles to select the text that you want to format. 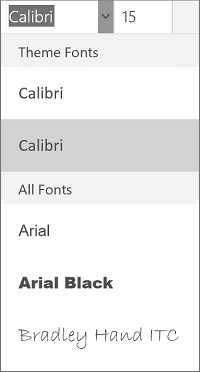 Note: On your Android phone, you need to expand the ribbon to see the Font group. To do this, tap the up arrow at the bottom right corner of your screen. To change the font, tap the Font box and then tap the font that you want to use. 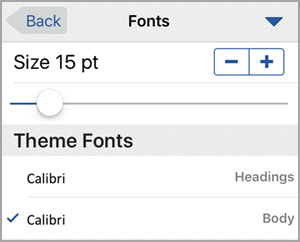 To change the font size, tap the Font Size box and then tap the font size that you want to use. 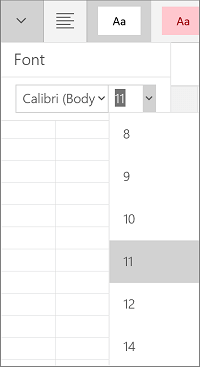 Use the handles to select the cells that you want to format. On the Home tab, tap the Font icon to expand the Font group. 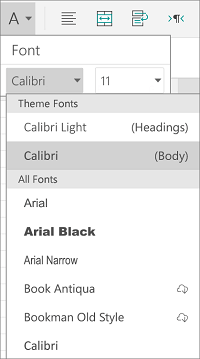 Note: On your Android phone, you need to expand the ribbon to see the Font group. To do this, tap the Edit icon at the top of your screen. Tap the area that you want to format. 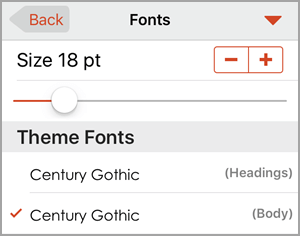 On your iPhone, tap the Edit icon at the top of your screen to expand the ribbon, and then tap the right arrow adjacent to the current font to see the Fonts group. To change the font, scroll through the fonts and then tap the font you want to use. 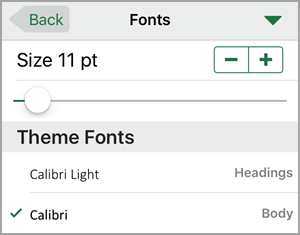 To change the font size, use the slide control or tap the minus and plus signs until the size you want appears. Tip: If you'd like to select multiple cells at once, tap and hold on the first cell, then tap on each of the additional cells you'd like to select. Tip: If you'd like to select multiple objects at once, tap and hold on the first object, then tap on each of the additional objects you'd like to select. 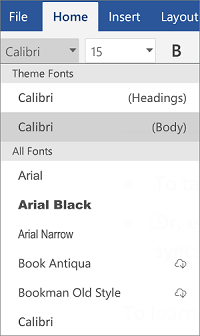 Note: On your Windows phone, you need to expand the ribbon to see the Font group. To do this, tap More at the bottom right corner of your screen. 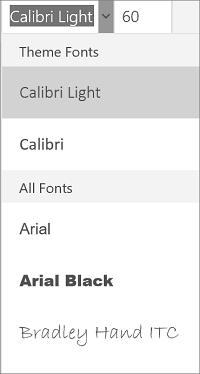 On the Home tab, tap the down arrow to expand the Font group. 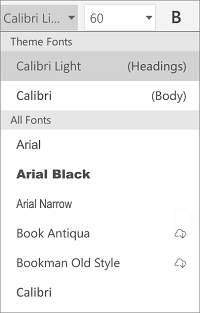 Note: On your Windows phone, you need to choose to edit a slide (either by double tapping it or by tapping it and then tapping Edit), then expand the ribbon to see the Font group. To expand the ribbon, tap More at the bottom right corner of your screen.